Christine Sycylo's sartorial signature includes lots of jewelry - "up to seven necklaces at the same time"- and black form-fitting outfits with splashes of color. But there was something that bothered her about her look: the clodhoppers she had worn for decades as a result of long-standing foot pain that resulted in her looking "like a classy woman from above the ankles and a bag lady from below." During a visit to her San Carlos podiatrist, Dr. Pardis Kelly, she was intrigued to learn about an injectable treatment that might relieve the pain in her calloused foot. More surprising were the products with which Sycylo would be injected: Sculptra and Juvederm, dermal fillers that are FDA approved to plump up facial lines and furrows. She decided to get the treatment, called Pillows for the Feet by Dr. Suzanne Levine, the Manhattan podiatrist who began performing the procedure in 1998 as a way of adding padding to the balls of the feet, an area that can become painful with aging, as well as with wear and tear. Nineteen months later, the 61-year-old Redwood City resident is still enjoying wearing her gold strappy sandals and high-heeled booties. "Without my heels I'm 5 (foot) 3 1/2. I like to wear heels that are about 3 inches. With these shoes, I feel prettier, sexier. High heels make me feel more confident," said Sycylo, a receptionist for an investment services company. Kelly, who was trained by Levine, said she's had 10 Pillows for the Feet patients. At first, the sore-footed seeking the injections from Levine were runners, a ballerina, athletes and others whose livelihood depended on being light-footed. In recent years, however, the procedure gained in popularity among well-heeled women, who wanted the oomph of elegant shoes without the "ouch." Levine, whose office is dotted with framed thank-yous from TV luminaries, actors and even a mercurial supermodel, says she has performed Pillows for the Feet for more than 1,000 patients and trained about 500 podiatrists. Side effects are limited to occasional discomfort lasting a few days, with just one allergic reaction that was easily treated, she says. Like Levine, Kelly predicts the procedure will become more popular with high-heel devotees in the years ahead. While Sycylo had to pay considerably more for her treatment because of the complexity of her foot problems, most Pillows for the Feet patients pay between $500 and $1,100 per foot. Male candidates for the procedure are rare. "This is very much a woman's problem," says Kelly, pointing out that most are in their late 40s or older. This is when estrogen production has plummeted, causing the fat pads that cushion the balls of the feet to atrophy, making the wearing of high heels - which places added pressure on this part of the foot - especially onerous. "Men's shoes are more roomy; they have more support," she said. "By the time a man's fat pads have made walking uncomfortable, he might be in his 70s or 80s and less likely to want to walk very far." Not every woman is suited to the dermal fillers, Kelly added. Younger, active women who are daily joggers, for example, may find its effectiveness does not last as long as it will for Sycylo, she says. Levine says the effects taper off in six to 12 months. But the president of the Alameda Contra Costa Podiatric Medical Association, Dr. Michael DiGiacomo, who has a private practice in Oakland, believes that even six months might be optimistic. The fact that the fillers are FDA approved for the face does not mean they will provide long-term relief for weight-bearing feet, he says. 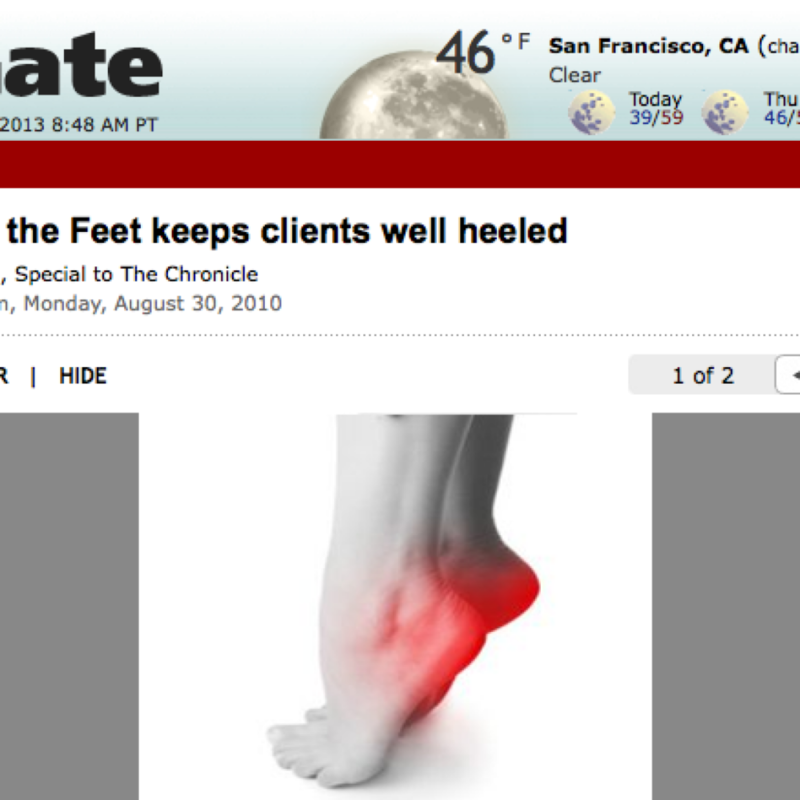 DiGiacomo's advice for "heeloholics:" Don't wear high heels every day. They will shorten calf muscles, putting even more pressure on the forefoot fat pads. If you wear them often, do frequent calf-stretching exercises. "Wear high heels, if you must, with thicker soles so you cushion the fat pad and the metatarsals," he says. "Also as we age, stability becomes an issue, so leave the stilettos for the younger crowd, as they put ankles in a more vulnerable position for the often seen ankle sprain." Like the rest of our bodies, our feet show signs of age and wear. Fat deposits erode, which can make wearing high-heeled shoes more painful, but there are other signs that your peds may be past their prime. Here are a few tips on what to look for and how to treat common signs of foot aging. Growing shoe size: Muscles, tendons and ligaments lose strength and elasticity over time, reducing their grip on bones and joints, making feet longer and wider. Simple fix: Don't scrimp on a new pair. Too-tight shoes keep podiatrists in business. Yellowed, brittle toenails: Fungus is the most common cause of discolored, deformed toenails in people of all ages, but is more prevalent in older people, due to decreased blood flow to the toes. This means fewer antibodies and infection-fighting blood cells are present to fight fungus. Simple fix: The cheaper generic version of prescription Lamisil is now available and effective in most cases. Over-the-counter remedies have significantly lower efficacy. More expensive is laser treatment, which works by eradicating the pathogens causing fungus. Labored steps: Over time, inflammation in the balls of the feet due to thinning of the foot pads, as well as flattening of the arches resulting from weaker muscles, tendons and ligaments, can sting every step. Simple fix: Wear customized orthotics. Avoid walking barefoot. Crooked toes and feet: With age, the fibrous tissue that encloses joints, together with ligaments and tendons, weakens and stretches, causing the bones that meet at a joint to shift out of alignment. At the same time, cartilage wears down, further destabilizing joints, resulting in bumpy feet and toes that are no longer straight and parallel. Simple fix: Choose shoes that match the shape of your feet, with a wide toe box to prevent friction in sensitive areas. Cracked soles: Aging skin produces less sweat and oil, and cell division slows, causing soles to become dry, cracked and crusty. The skin may be yellow or brown. Simple fix: Slough off surface skin cells with exfoliating scrub or pumice stone. Moisturize daily. Wrinkles and age spots: Like the rest of our body, our feet are not unscathed by the ravages of sun and marching of time. Simple fix: Use sunblock to prevent further sun damage. Drugstore creams containing glycolic acid may smooth lines on toes and sides of feet. Some podiatrists treat foot wrinkles with Botox and age spots with chemical peels. To read this article on SFGate.com please click here.